Comment: Upfront: I was surprised to see this star ruby offered as a USA mined product but after some research I have no reason to doubt the origin, even if the GIA report states only 'NCL Type 1' but not NC as exact origin. 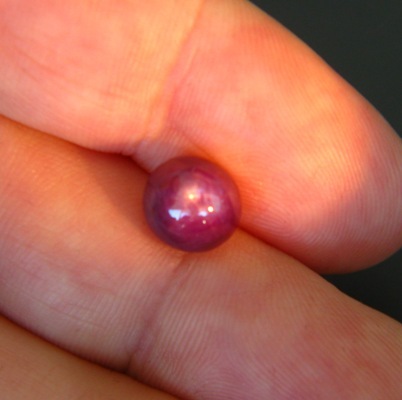 However, the gem fits very well into the typical star rubies that are found in NC: Strong purplish red, opaque and medium sharp rays. 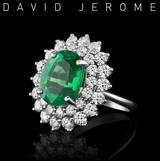 The gem is GIA certified as unheated and that for us is the primary issue. If the NC origin is important to you we can always re-submit the stone for further testing. 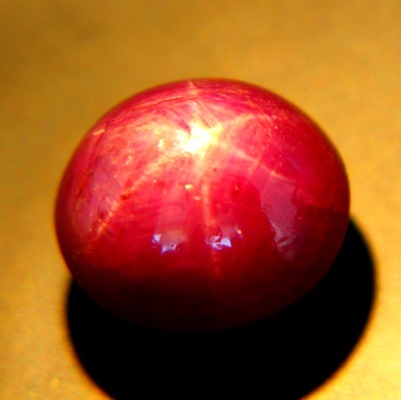 All-in-all this is a very pleasing mildly rose coloured ruby with a good ray, no flaws, no overweight in the back, a good finish and in fine roundish dimensions. In a more opaque-ish star the rays always sit on the surface of the cabochon (read 'judging stars on photo' for more insight). Please see the 'no-ray' image to get a better idea of the ruby's body colour (rose red). 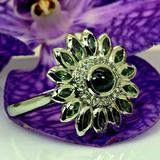 A nice gem for a lady's ring or as something special from the USA in the collector's box. * This gem is on a world-tour. It may still be available but will need extra transport time. Inquire here.